A trusted resource for brain injury in Colorado. MINDSOURCE connects individuals to services that can best address their complete medical and/or behavioral health needs. To advance systems, facilitate research, and assure support services for individuals with brain injury. Enhanced quality of life for everyone in Colorado living with, or affected by, brain injury and their communities. MINDSOURCE is dedicated to brain injury research, awareness as well as identification, understanding and support for all those affected by brain injury in Colorado. The Colorado Traumatic Brain Injury Trust Fund is administered by MINDSOURCE and results from surcharges on a variety of motor vehicle convictions including Driving Under the Influence (DUI), Driving While Ability Impaired (DWAI), Speeding and other moving violations. 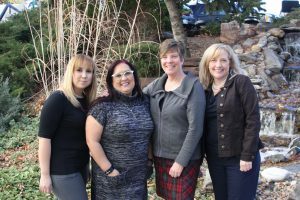 The MINDSOURCE team includes (l-r) Melissa Herrera, Regina Rodriguez, Judy Dettmer and Karen Ferrington. Melissa provides multiple support functions to the Board as well as the staff in her role as the team’s Administrative Assistant, Regina manages all procurement and budget functions as well as diversity and inclusion priorities as the Contracts Manager, Judy is the brain injury subject matter expert and Director, and Karen is the Project Manager working to oversee the many initiatives of MINDSOURCE.